The British Berkefeld HIS is fitted with one filter candle. As standard, the HIS takes filter candles which are 10 inches long, 2 inches in diameter, with a short mount. 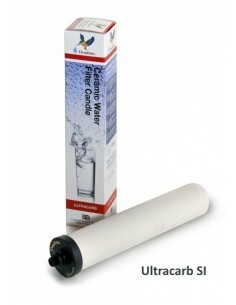 The HIS can be fitted with Supercarb(SI)™, or Ultracarb(SI)™ water filter candles. *Tubes for connection to water mains are not included.